The 2015 Florida Gators was both exciting and frustrating for the Florida Gators faithful. They won more games than they were expected to, but limped to the finish line with three straight losses by a combined score of 97-24. 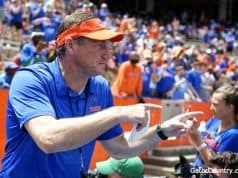 The Gators enter the off season in a state of looking back at what worked and what didn’t quite work, or how and when it started to fail. While the Gators will focus heavily on fixing the offense in the off season, the Gators do have some things to praise and look back on from the 2015 season – the biggest praiseworthy unit being the defensive line. 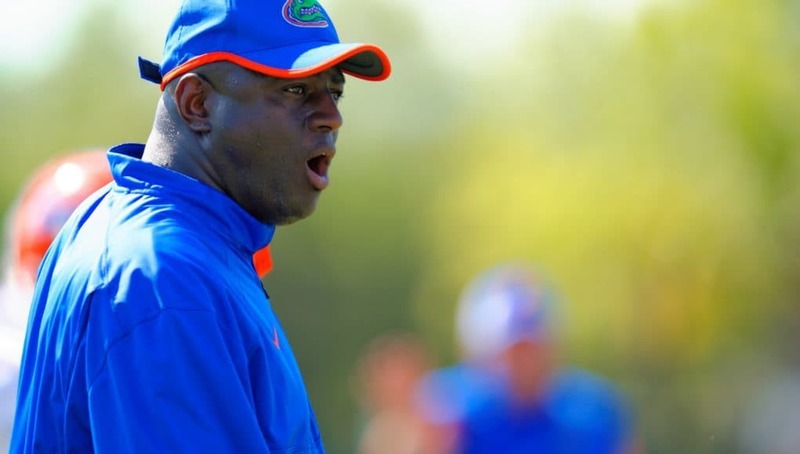 Under the tutelage of first year defensive line coach Chris Rumph, the Gators defensive line not only held steady from their great 2014 performance under Brad Lawing, they actually improved quite substantially, something almost no one expected, season over season. Entering the season trying to figure out how to replace first round pick Dante Fowler, many weren’t quite sure how the Gators might do in the sack and tackle for loss department after a season where they ranked 20th in the country in county in opponent plays that resulted in a turnover, sack, or tackle for loss and averaged 2.5 sacks per game. 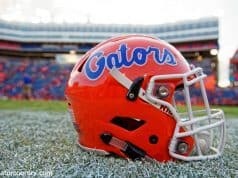 However, not only did the Gators just beat those numbers this season, they destroyed them. Throughout the season, the Gators ranked in the top-10 for ten straight weeks in the vaunted category of percentage of opponent plays that result in a turnover, sack, or tackle for loss. Their 19.04% rate ranked 6th in the country. Moreover, the Gators averaged just over three (3.08) sacks per game, which ranked fifth in the country and only during one game did the Gators not record a sack. 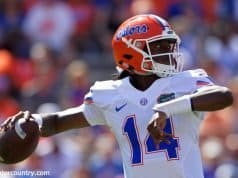 Further, the Gators finished the season sacking opponent quarters once every ten times they dropped back, which too ranked fifth in the country. Continuing, after ranking 16th in the country in tackles for loss this season, the Gators finished the season ranked 14th in the country. The Gators ended the season with two players, Alex McCalister and Jon Bullard, ranked in the top-100 for total sacks, both ranking 72nd in the country with 6.5 sacks each, both for 48 total sack yards respectively. Jon Bullard also ranked nationally (21st) in total tackles for loss with 17.5 for 88 yards. The Gators ended with three defensive line players (Bullard, Morrison, Cox) with more than 10.0 tackles for loss on the season, something only one player did last season. Further, they had six defensive linemen finish with at least three sacks; something only three did last season. And finally, according to the fine folks over at SBNation, they determined that Gators defensive line caused havoc, which means, “the percentage of plays in which a defense either recorded a tackle for loss, forced a fumble, or defensed a pass (intercepted or broken up)” on 7.7% of plays solely by themselves, which ranked 8th in the country. While rush defense is not just the product of the defensive line, it takes solid linebacker and secondary play, it is at least more defensive line related than not. The Gators have had a very strong rush defense for the better part of the last decade and last season was no exception where they ranked 8th in the country. This season, the Gators knew their plate was full when they had to face Jalen Hurd, Leonard Fournette, Dalvin Cook, with Derrick Henry added on at the end – three of whom placed in the top-7 of the Heisman Trophy rankings. They weren’t expected to be able to contain all three, but the Gators finished the season ranked 12th only allow 3.39 yards per rush attempt and eighth in rushing touchdowns allowed. And don’t think these numbers are based on a small sample size, only about 30% of FBS teams had more rushing attempts (508) against them this season. But the Gators rush defense was subjected to the lack of offensive production. There was a direct correlation between first and third quarter rush defense and second and fourth quarter defense after three and outs and a lack of offensive production caused the defense to spend more time on the field. In the first and third quarter the Gators rush defense ranked 12th in first quarter rush defense and 3rd in third quarter rush defense, while being ranked 74th and 68th in rush defense in the second and fourth quarter. Previous articleCan the Florida Gators Hit All Nate Craig-Myers Check List?